yeah yeah, i know, i haven't blogged in over a week. thanksgiving weekend 2007 went something like this: boba and spicy chicken. "first time," lip syncing, gloves and hilarious expressions.pumpkin cheesecake. turkey, ham, potatoes, stuffing (no chestnut :( ), and wii (which was actually kinda, uh, exhausting). graffiti on a touchpad. "BART BOY!" lots of laughs. portos. portos closed. souplantation. chicken noodle soup. blueberry muffins. compton. incompetent circuit city workers. boys and cars. target. the office. elaine's new camera. manicures. room arrangements and fate. fried chicken, ribs, and cornbread. a 22nd birthday. comedians. strawberry fantasy and pineapple&malibu. "martha stewart day." jo-ann. beads and wire. cupcakes and frosting. christmas cards. chili dog and chili cheese fries. all this and i only took 30 or so pictures. i am thankful for a lot of things this year. family. this crazy thing called scrapbooking. my crazy friends. and so much more. the best part of this weekend had to be hanging out with everyone and sharing lots of fun moments together. it was kind of nice to just take part in the festivities and not be clicking away behind the camera, for once. I think your earrings are pretty sweet. 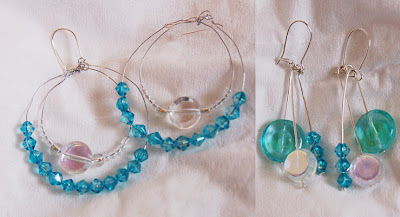 Long ago I got a seaglass jewelry kit for pennies on the dollar and made myself a few pairs of earrings. Still wear them. Still get compliments on them. And I am no Anilu either. But isn't it neat to make something you can wear and enjoy? I love your earrings!! the colors are beautiful!! cute! I like the circle ones! You are too funny, C!! I love your creations!! I am totally loving the earrings! I'm with you, those half off sales in the bead aisle get me every time. I was busy too so I get it. I loved all the family in town, but I am also glad they are gone...lol. Oh my gosh, you rocked those earrings! So fun! Even though it's a bummer that you don't have photographic documentation... sometimes it's fun to leave the camera in the bag and just enjoy the fun being had. I'm glad you had a great weekend! Cool earrings! Love the blue! sounds like you had an awesome weekend. I was at circuit city and target on black friday too. where you crazy like me standing in line at 3am? Awesome layouts!!! And those earrings... gorgeous!